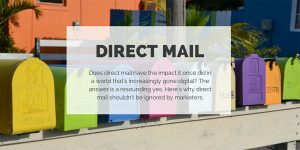 In the age of Google AdWords, Facebook, and Twitter, direct mail marketing appears to have no place at all. Digital marketers think that the days of sending printed marketing materials like postcards, sales letters, and newsletters, among others, are over. But experienced digital marketers know that direct mail can enhance the results of an online marketing campaign. Consider this statistic—in 20017, emails had a disappointing 25% open rate. This means that only one out of four emails sent by marketing teams is opened. On the other hand, at least 80% of consumer open direct mail. This shows that traditional direct mail marketing can yield the desired results for businesses. While an old methodology, direct mail is tried and tested. And when done to complement digital marketing, it can leave a huge impact because it gives a hand-on experience for consumers. Direct mail can be used in conjunction with online marketing to create a more impactful brand experience for customers. Doing so can enable direct mail to make up for the weakness of digital marketing in the same way that the latter can balance the weak points of the former. Direct mail has several advantages like the ability to send out personalized messages. Just like in digital marketing, personalizing messages have been found effective to increase response rates. By sending out personalized mail to customers, brands will have better chances of getting responses from their consumers. This tried and tested marketing technique may also come in handy given the recent privacy concerns brought about by the Facebook brouhaha. With direct mail, brands can reach out to their targeted consumers and more importantly, engage them. The bottom line is that traditional marketing methods should not be overlooked in today’s digital world. Combining direct mail with online marketing efforts could yield positive results for any brand.